In the latest installment of Kiyosaki&apos;s Rich Dad series, he opts for an innovative approach with largely diminished returns: struggling with a way to inform average citizens on the current economic crisis, and how to rise above it, Kiyosaki decided to write a book in online installments, seeking the questions and comments of his readers (which are peppered throughout this print version). Though an undeniably effective technique for help readers identify with the material, more professional input would have produced a volume buoyed by more of Kiosaki&apos;s lucid explanation, and less bogged down with repetition, poor pacing and a rigid view of government policies. Regurgitating dogma from previous books without fleshing them out, it seems Kiyosaki is less interested in creating a new volume than in teasing his old volumes. 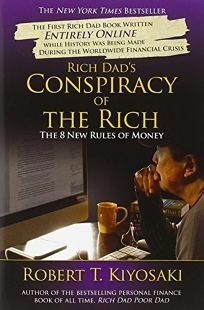 Kiyosaki&apos;s fans will doubtless buy this and may enjoy it, but readers new to the Rich Dad series will feel obligated to buy his other books for a proper understanding-something of a ""conspiracy of the rich"" in itself.